75% of the Indian population gets affirmative action quota in India and is genetically low IQ. 25% of the Indian population is upper caste and higher IQ and does not get quota. Most of the upper caste population has Y-DNA = R1A = Russian / Slavic. AK: The Slavic max. potential IQ appears to be around 100. In North India Upper caste > Other Backward Caste > Dalit – Untouchable – Tribal. Brahmin > Dravidian Backward Caste > Dravidian Most Backward caste > Dalit-Untouchable-Tribal. Upper castes and Brahmins dont get quota. In North India, upper castes and Brahmins are genetically the same of Aryan origin. In South India, the only Aryan origin caste is Brahmin. 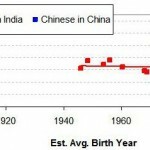 5% of the Indian population is of Oriental race and they dont have a high IQ. Next vegetarianism = Most upper castes, the higher IQ segment is vegetarian. The lower castes are non-vegetarian and have lower IQ. AK: This is interesting. I wonder to what extent (if any) Brahmans can improve their intelligence even further by switching to a meat-based diet? I know that among high-caste Indians adherence to vegetarianism is far from universal. I lived with two of them one. That said, being “non-vegetarian” may not mean that much for most Indians, as most are too poor to regularly afford meat anyway. Jains are a 100% vegetarian merchant caste and they have beaten the Jews in the diamond trade, even in Tel Aviv. The world chess champion Vish Anand comes from a vegetarian brahmin family. AK: As I said, Brahmans appear to be the Jews of India. The most famous Soviet/Russian chess champion, Kasparov, is an Armenian Jew. Actually more than half of the Soviet chess champions were Jews. The most prominent exception was Anatoly Karpov. In the Indian Manhattan project team of 18, of which 15 were brahmin and 3 merchants. In UK, they outperform whites academically and per Lynn , in the 2nd generation, measured and IQ of 97. In the USA, 60% of the Indian diaspora is upper caste, and 40% from middle-level castes like Patels and Sikhs. AK: The mean IQ of Indian immigrants to the US is 112. In the US diaspora, Sikhs and Patels despite being 40% of the diaspora, win just 4%. In the UK, these same Patels and Sikhs are 80% of the Indian diaspora and easily outperform whites academically. The above data, also shows that sampling has to be very accurate to reflect the various caste IQs. AK: Why only Math, and not also Reading and Science? (including them would bring down average IQ to 75.4). Next step is to remove the bias caused by the PISA sample having 75% bilingual kids (Tibetan kids facing Hindi PISA exam and Telegu kids facing Tamil PISA exam). AK: Fair enough – though this adjustment is needed not just in India. Next there is a 40 point difference between scores for ‘Village’ and scores for ‘Large city’. In HP and TN, the village category is over-represented by a factor of 4. Even worse, in HP, City and Large City are entirely removed from the survey sample. So adding an urban correction of 20 (half the village-large city difference). Next we look to the future as malnutrition is removed. The only Indian kids who go to govt school is for the mid-day meal; if they are not starving they go to private school. Private schools score 45 more than govt schools and that’s the future as poverty reduces. AK: Not necessarily as it is richer (on average more cognitively endowed) Indians who are today sending their children to private schools. Disagree with this adjustment. that serve the top 15% are included in the survey. And they have an entirely different IQ profile and cause an IQ bulge at the top end. AK: A plausible estimate, with the IQ bulge at the top bringing up average Indian IQ by another point or two. But crucial flaw as far as I can see is the +45 point (+7 IQ points) adjustment, which assumes that the cognitive potential of private and public schoolchildren is essentially equal. That is very unlikely. 15% of the Indian population is Muslim, who are also highly inbred, and brainwashed in islamic madrasas, which lowers IQ potential. Another 15% is untouchable and another 10% is tribal. These 3 groups as a whole have an IQ ceiling , even with nutrition of no more than 85, and these are 40% of the population. The middle 40%, the Patels and Sikhs, based on UK performance, have an IQ ceiling of about 95. Averaging the lower 80%, gives an IQ ceiling of 90. Anything beyond 90 IQ average ceiling, is a bonus and that’s due to the top 20%. Most PISA type surveys are going to catch the bottom 80%. The top 20% is extremely urbanised and goes to very good quality private schools. The Orissa TIMMS survey, showed that the 95th percentile was comparable to 95th percentile of Norway and Orissa is a very backward state. On a system wide level, India is going to behave like 90 IQ ceiling. On cutting level achievements, the top 20% is extremely world competitive. Orissa’s TIMSS 95% percentile compares favourably to Norway’s because Orissa’s is one of India’s higher scoring states and Norway is oddly enough Europe’s lowest by far. Norway’s 95% percentile was 573 (Orissa’s 577) but this is significantly lower than Bulgaria (611), Serbia (618), and Romania (619). To add some more perspective, neighboring Sweden is 614, Lithuania 628, Estonia 645, and Latvia 625. Russia is at 632, America 635 and England 627. To cap it off Hong Kong is at 691, Japan 697, South Korea 715, Singapore 723, and Taiwan tops the charts at a ridiculous 733. India’s top 5% would not even make the 50% cutoff in any of the east Asian polities. Rec1man’s Qatar comparisons are even more irrelevant because he is comparing the absolute HIGHEST ranked schools of high sigma Indian professionals in the country against OECD AVERAGES. Pick out the highest ranked school in Shanghai or the 10th for that matter and compare it against them and you will see just how far the gap is. The data tables are available online for anyone who cares to delve more deeply into them for the 2009 PISA at the following link. Selecting the two Indian participating states that (QTN and QHP) with the variable ST19Q01 as the student variable compares how well Indian students did based on the language of the test. Indian students who took the test in a language OTHER than the one spoken at home score higher than the ones who took the test in their native language. By the way, Richwine’s backward digit span test correlated to a 112 IQ for India’s taken from the GSS survey had a sample size of less than 10 if I recall.